There are two types of people in this world. 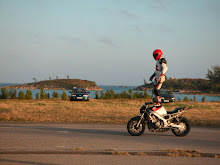 Those who are daredevils, and those who aren't. Those who aren't become insurance brokers in order to finacially cover those that are. That's how the world works. This is Evel Knievel's fault. The next time you have to put on a suit and head into the office to sit in front of a computer and listen to copiers running all day and wonder whatever happened to that wonderful life as a kid skateboarding over a plywood ramp with all your friends and hoping that your mom would let you stay out another hour because the sun was still up.......blame him. It's easy to fall off a ramp at 80 miles per hour, but it's not easy to get people to pay to watch it. EK (which, interestingly enough are my daughter's and wife's initials) died late last year, at 69 years old. Probably through boredom. He not only influenced me and all of my friends in our formative years of the 70s, but is the reason I am still the way I am. It was a revalation to see someone ALLOWED to act that way, albeit under strict supervision. 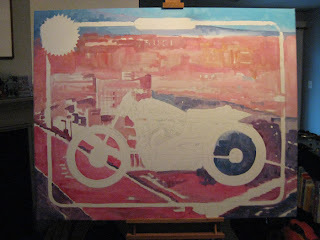 He is the King of Daredevils, and that's why I'm painting his bike. Now, before the thousands who read this blog begin screaming sacrilidge, I KNOW he jumped a modified Triumph Bonneville, but after several months of research and attempting to contact his Estate, I got nothing imagewise. 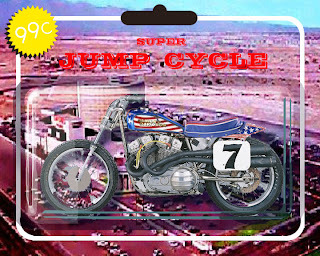 So I used one of his many other jump cycles, the 1972 Harley Davidson XR750. This particular bike is now on display at the Smithsonian.